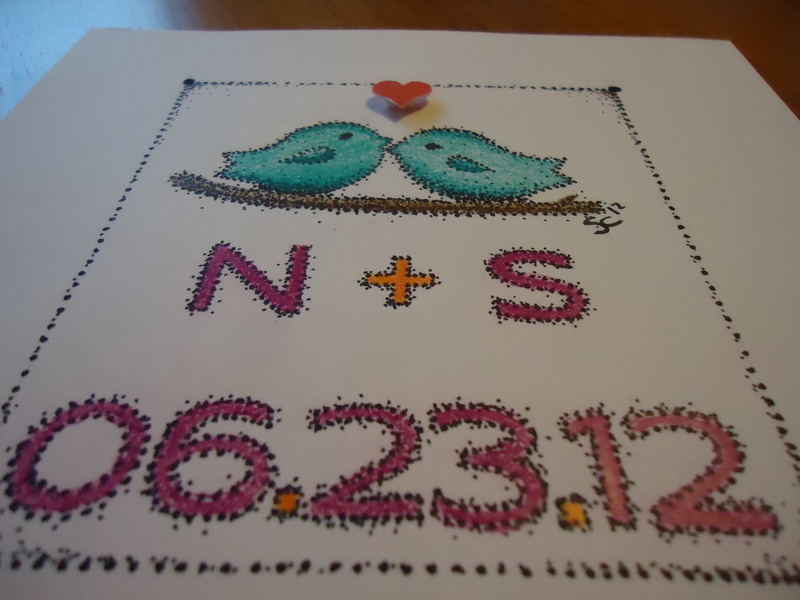 I made this artwork for several engagement presents and bridal showers. 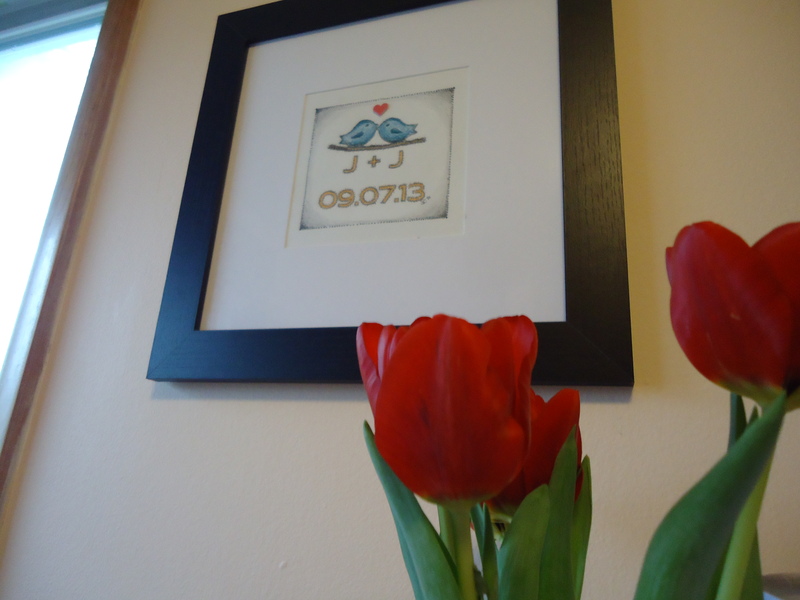 Of course, they are the perfect wedding present too! You can personalize the initials (or use the couple’s last name) and even use their wedding colors if you want. If you look closely, the artwork, letters, etc. 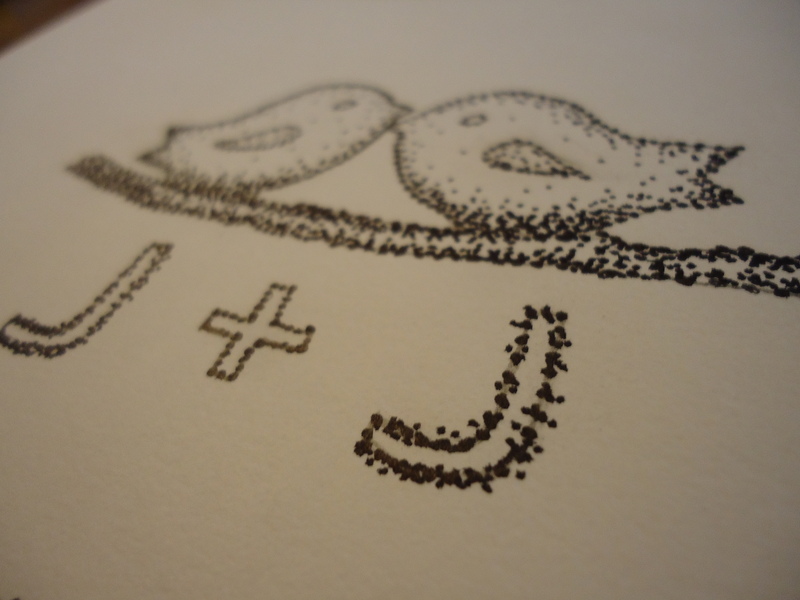 are made from tiny dots. The heart is 3-D so it sticks off the paper a little. Believe me, you can do it too! To make something similar…. 1. Birds-Find a picture of two birds kissing (or other animals) on the internet. I don’t use the EXACT picture, just the outline. I actually used a picture of a piece of jewelry with birds. The birds were on a very long branch and they didn’t have the little wings; I simply added these details when I was drawing. So use your imagination when selecting something. Before you print, you might have to adjust the scale to get it right (I adjust the scale by changing the percentage on the print page- from 100% to smaller sizes until I see it fits in the frame well). **Consider the frame/mat size when estimating the size!! 2. 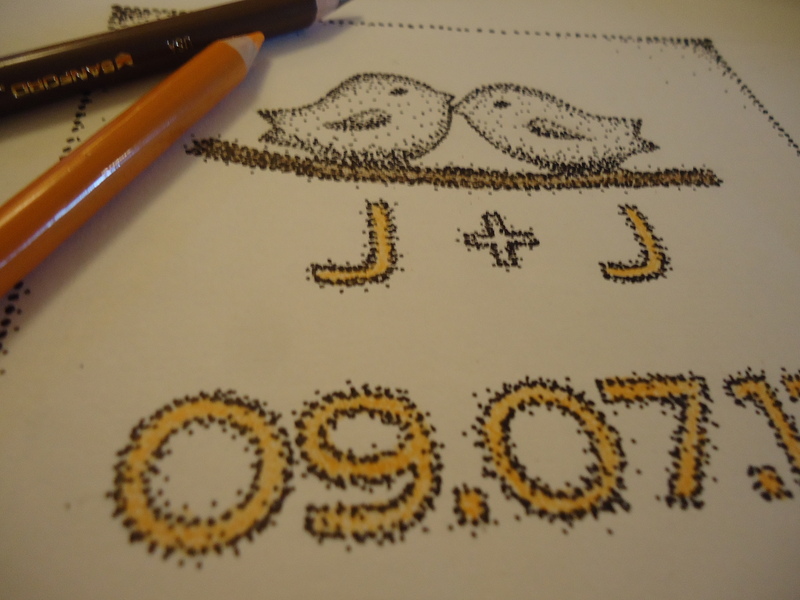 Letters– Open a word document and pick a font you like and type the couple’s name and wedding date. Use a large enough size and thick enough letter to be able to trace and color in the letters. You might need to play with the size of the font/bird picture to make sure they look good together. ***Again, consider the size of your frame/mat!!! 3. Tape– Tape the bird picture/letters to your drawing paper. You’re going to be tracing, so the image should be taped down, against the drawing paper. 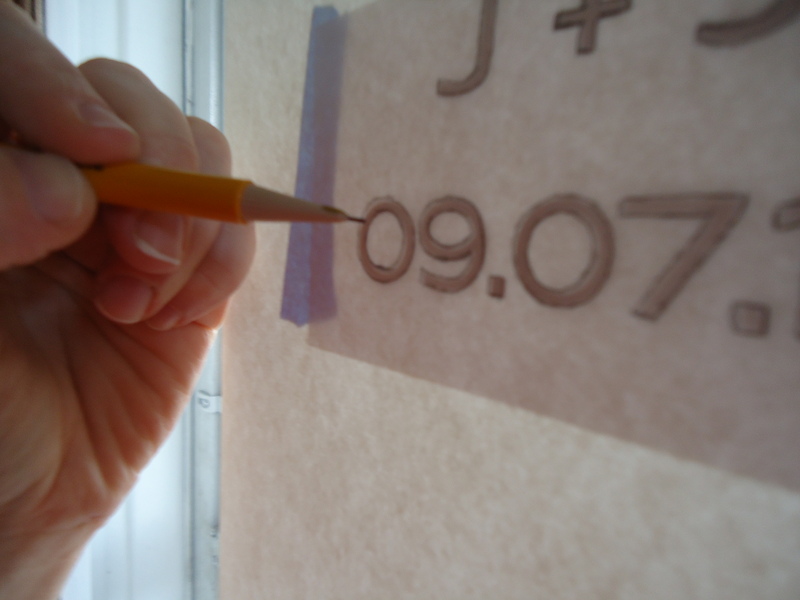 Make sure they are spaced correctly and that you use either blue painter’s tape. If you use scotch tape I usually press it against some fabric (like my jeans) so that it loses some of it’s stickiness before it goes on the paper to avoid ripping. 4. Trace– Trace the OUTLINE of the birds and letters onto your drawing paper. I use my back door because the window brings in a lot of light. You can do it up against a window too. Just lightly sketch a basic overview of the lines. When I trace it, I also tape it to the window so it won’t budge. OR if you’re awesome you can free hand it. 5. Dots- Take off your tape and printed “cheat sheets”. 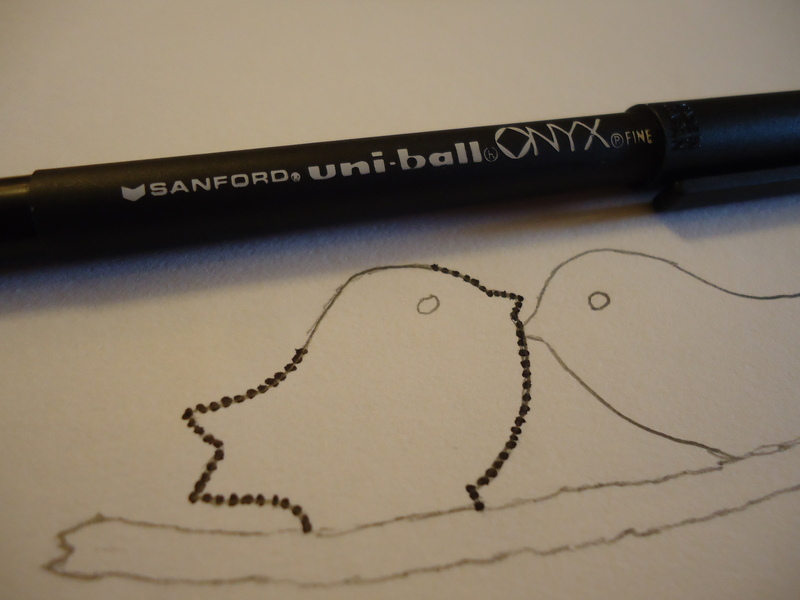 Then start by making medium sized black ink dots along your traced lines. I made the outline a with larger dots so they are more pronounced. Try to make them even in size and take your time. I make the outline dots larger and then go to smaller pin-point sized dots inward. This is the time consuming part! It takes a while to get all those dots on there, be patient! 6. Fill In– After you have outlined all your words, start making small dots slightly inside the border. Your dots should be heavier around the edges then fade to light as they go into your letters. I also put some smaller dots on the outside of the letters. On the inside of the birds and letters I have almost no dots, as they will be filled with color anyway. 7. 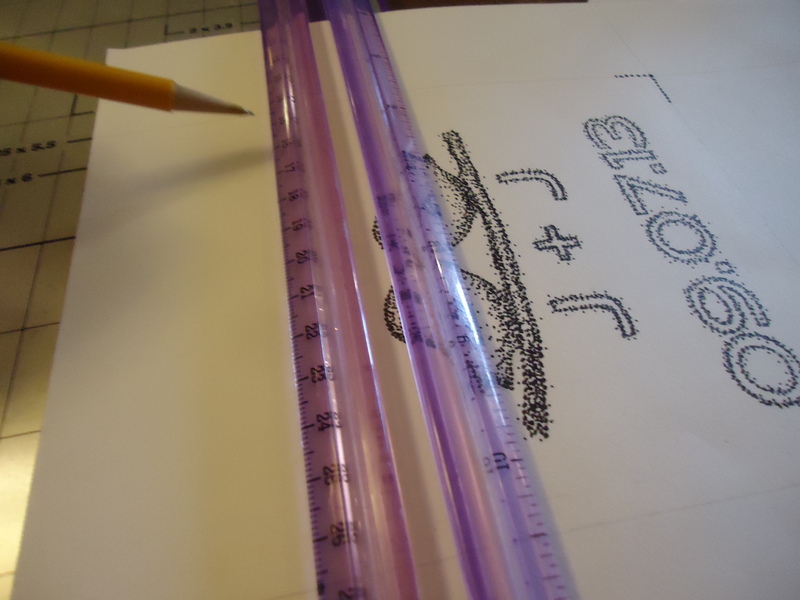 Erase– When you have enough dots and you’re happy with the overall look of it, erase any pencil marks. But make sure the ink is completely dry or you will smear it. 8. Border- I used a ruler to create a square border around the birds/letters. Remember to take your frame and mat size in to consideration when creating a border. Again, I outlined the pencil marked with dots. I used larger to small dots and I concentrated more dots in the corners. 9. Color- Using sharpened color pencils make small light circular motions. Be sure to create light marks using a uniform circle. This helps the color apply evenly. I also used a light grey/silver color around the border and in the corners to add more detail. I used heavier color where the darker/heavier dots were. 10. Heart – To make the heart I used my Cricut, but you could easily use a heart punch from a craft store. Or go old school and fold a small piece of red paper and cut it into the shape of a heart. 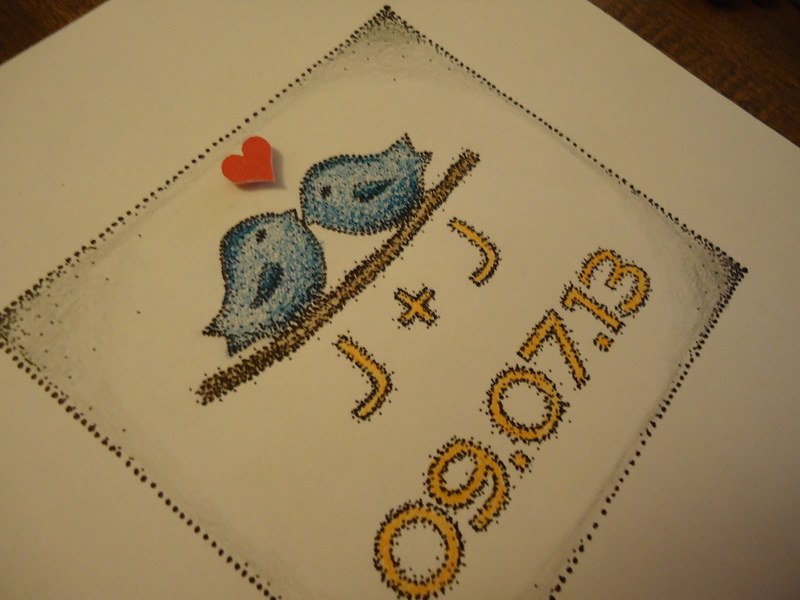 I used a raised double-sided sticky foam square to give the heart a three-dimensional quality. 11. Frame– Frame the artwork using a mat to class-it up. Here is another example of one I created…. I plan to do something similar for some expecting mothers. I want to try a baby elephant or cute animal and the new baby’s name and birthdate. I’ll post pictures when I get to it!